Discombobulation was a word a friend of mine used often once upon a time ago, (they frequently felt bewildered and liked how the word, spoken made people laugh) now it's my word du jour on this strange menu I'm regarding with something like deja vu, even if it's as new as the day. Choose a mood, choose sad, bewildered, desirous, or discombobulated, the list goes on but those are the main emotions I'm fraught with now and the last one encompasses them all, so that's me. I'm officially rather messed up and there's nothing for it but to accept this state then gradually start to reorder myself to suit an entirely new attitude. Hopefully I can eat those moods and digest them, then revive myself. 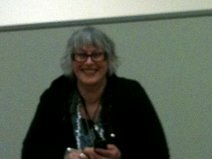 I caught some extra open-heartedness in Amer i ca, from the wonderful friends I have there. I believe I'll never be the same again in other ways either. I like to be generous since it is after all the last thing we need to pay heed to, if we're to live a happy life, (one of these blog posts of mine has the recipe for happiness at the end of it, you may recall), and now I want to be even more generous in new ways. I'm more willing to be kind to myself I think. Recalling fond memories has to be a part of that decency. 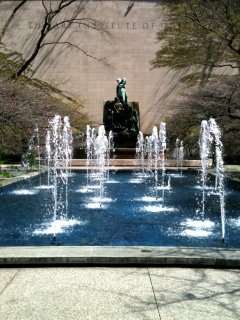 The day this April when I met Laura Lee and we walked down from my grand retro hotel which over-looked the park in Chicago, she took this photo below of the fountain outside the Art Institute. I'm so grateful she sent me some pictures since many of mine were stolen, with my laptop. (The Los Angeles Airport police told me today they would not report it as a theft since I did not see anyone actually take it. Since I have not had it returned however, it is not at lost and found after more than two weeks, to me it is stolen). The photo below is lovely in any case and Chicago's art museum, 'the art institute' is a vast building with bronze lions outside, they're green with age and gaze out over the pedestrians and traffic as if a tundra rolls on by full of antelope and zebra for their lionesses to hunt. Laura and I were hunting for beauty, or rather for proof that other people could see beauty everywhere like we can. Art is our talisman against the ugly-mongers you see, those who try to tell us the world is a mean, narrow place full of dreck and ruin. Once we'd feasted on paintings and sculptures, on conversation and commentaries, we went into the members lounge and talked further. Now, I think about walking past trees there surrounded with forget-me-nots and sending a shot to someone else by cellphone, the ease I could do that with and I'm drawn into myself like I've been bitten or stung. I miss my friends so much. Adam http://www.gillico.com/ who I've only known for a couple of years but got to know well playing Scrabble online of all things, he also designed the book, Shamfeign for my small press, BF Publishing (named after my son and his best friend in all the universe - friendship's quite a theme here) http://shamfeign.blogspot.co.nz/ and Nigel who was my first-ever publisher Martian Way Press, he's from NZ but now lives in Chicago and is an architecture buff, so I was treated to a personal, highly informed tour of the city. Mother, are those your bones? I think this indicates something of what I am trying to write my way towards here, how there are some things which are so important they cannot be dismissed easily or sometimes, at all. We friends met in any case and I travelled for a month and half, in circumstances purely for love. I went to see these fine people in Amer ica because I love them and we all love writing, books and work published so others may see what we love, too. We were all equally pleased and at ease with each other in various individual ways, as if we had certainly known each other well before and were only meeting again, except we had this extra cloud of delightedness about us since we'd only known each other on the internet, all were people scattered across the world and really, it was a supreme effort and extraordinarily expensive to see them all. Not to mention taxing on my emotional state, which is often not that erm...shall we say, easy to live with, (ha). It was a magical circumstance and still affects me as if I'm under a spell. I keep dreaming they are here visiting me, some of them. Occasionally I have conversations with them as if they are here, (long discussions in my head. I can imagine what they'd say to just about anything, correctly or not, I do). It was as Amy in Seattle said, like Christmas, (in April). Katherine Mansfield said, 'I always felt that the great high privilege, relief and comfort of friendship was that one had to explain nothing.' Yes, we could just be ourselves and enjoy the company of another with some ease and much excitement. Now, memory is serving me something I'm not sure I want to contemplate. Our memories are never the actual experience precisely over again, we adapt and change what we recall constantly to suit whoever we are at the time when we draw the thoughts back to ourselves, sometimes for comfort, or otherwise to inspire, to be reminded of a detail we need to relate to current events or suchlike. But my memories are fading and many of the photos I took were stolen with my laptop, even if I do have some more on other devices, so now what am I left with? The desire to go back there and to have friends visit me certainly, I am left with those great ideas but there is something else here in mind which is not at all welcome. I must rid myself of it as fast as I can, or it could take over and dark places are hardly a good place for anyone to dwell, are they. (No question mark, gloomy circumstances not good for people, especially this one, full-stop). Poetry and art are the answer, I often say. (lost their job that day, snapping at their supervisor). Then the woman found the boxes torn apart by dogs. poked the parcel with a stick and read the label. a volcano of missed anniversaries and parties. (when she did the decent thing and self-imprisoned). each tend to find more sun and space. when asked for another reading, in the booth. an empty mind-room with guests' photographs. on an old gravel swamp bed near a spring. raced into the deluge as if washed in light. many stone hearts in the land with a ringing slice. while pebble glass captures and plays elsewhere. she laughed and soon fetched the better china. a good fire set with their talk and touch. This type of post also helpful for Volunteer Travel. I also need this type post. I like this post. Keep it on. Good Luck!